The Recording Feature is available for an additional monthly fee, allowing sessions to be recorded by the session host. To request a quote to enable recording, or to disable recording on your account, please contact our Sales Team at [email protected] . 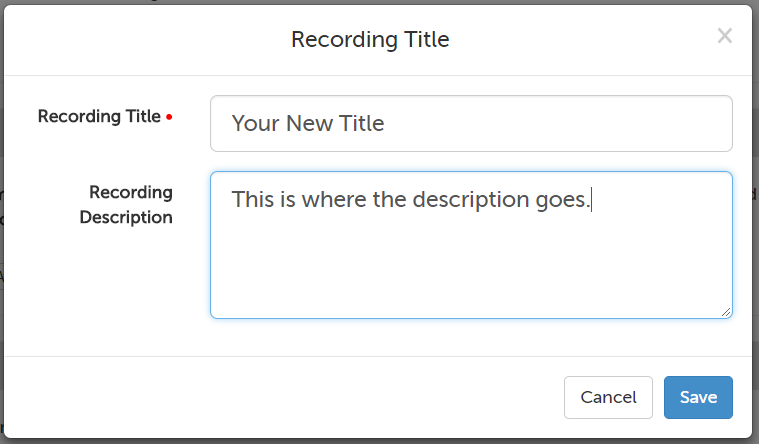 If you are an Account Administrator, Clinical Supervisor, or the owner of a recording (i.e., you scheduled the session that was recorded), this support article will show how to edit titles on your recording. 1. Click on the "Recordings" tab and select "Recordings" from the drop-down menu. 2. Any recordings created in the last 60 days (that you have access to) will automatically appear on the next page. Change your search parameters if the recording you want doesn't appear. Click the "View" button for the recording you want to edit. 3. Click the "Edit Title and Description" button at the bottom of the page. 4. The default title uses the meeting number and start date. You can replace this with a title of your choice, and then click "Save" in the lower right hand corner. There is no default description, but you can add one. 5. The title of the recording will change on the page, underneath the name of the recording owner at the top. This article was last reviewed by our Support team on October 27, 2017.